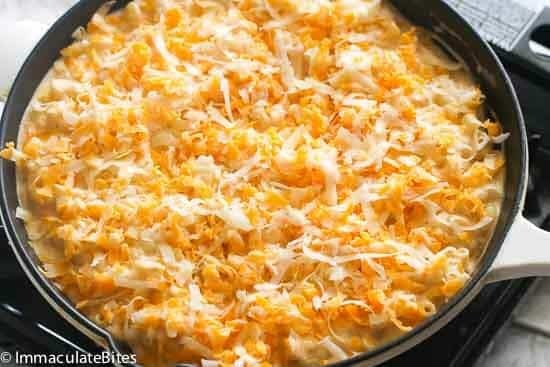 Southern Baked Mac and Cheese – super creamy, cheesy, soulful baked mac and cheese filled with great Southern flavors . You will never break open a box again! I wasn’t a fan of Mac and Cheese back then. But as they say, everything change. Over the years, I learn how to love that cheesy creamy goodness which is a staple in every American household. Thanks to my son who seriously would live for mac and cheese every single day of his life. Yes, he is a huge fan of those boxed mac and cheese! He’d gladly turn down any scrumptious chicken dishes I make just for a plateful of his all time fave. You could imagine my face the day I tricked him into eating REAL mac and cheese. Ahhh, it was a sweet victory! Not for long though. To start off, this cheesy bechamel sauce here is over-the-top! Aside from 1/2 cup of half and half (of light cream and whole milk), I also added a can of evaporated milk (different from condensed milk) to add more creaminess and texture to my mac and cheese. And another secret I’m adding to this sauce? CREOLE SEASONING. Yes! 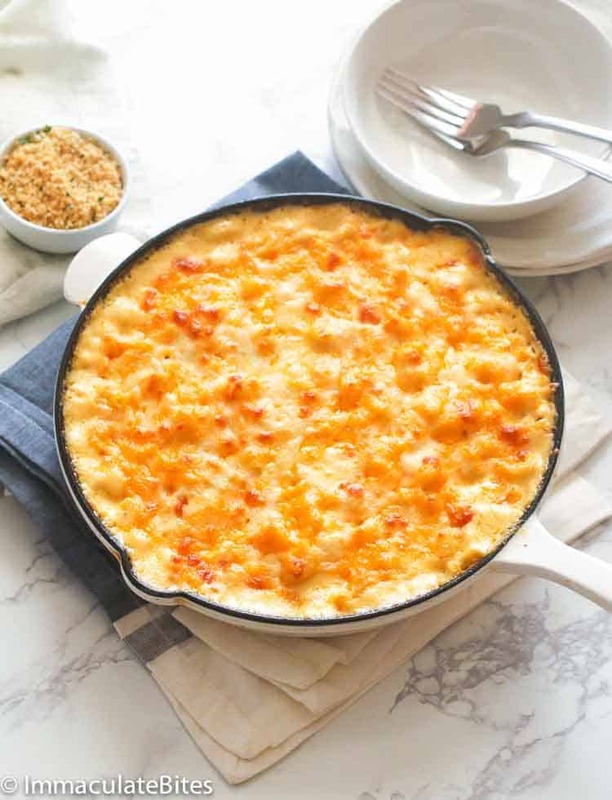 Sprinkling it with 1/2-1 teaspoon adds dimension to this Southern Baked Mac and Cheese. Am telling you it makes all the difference , unless you like bland. Don’t be scared when using cheese for this recipe. I used three (3) types of cheeses to grace in every noodle of this dish. For best flavor, I highly recommend adding a sharp cheddar to your baked mac and cheese. Just a warning though, don’t use the pre-shredded bagged cheese as it has stabilizers that makes it drier compared to fresh-grated cheese. Sharp cheddar cheese, mozzarella, jack cheese, are my top fave. Or you can also use pepper jack cheese, gouda, fontina and Gruyere. How long to bake mac and cheese? 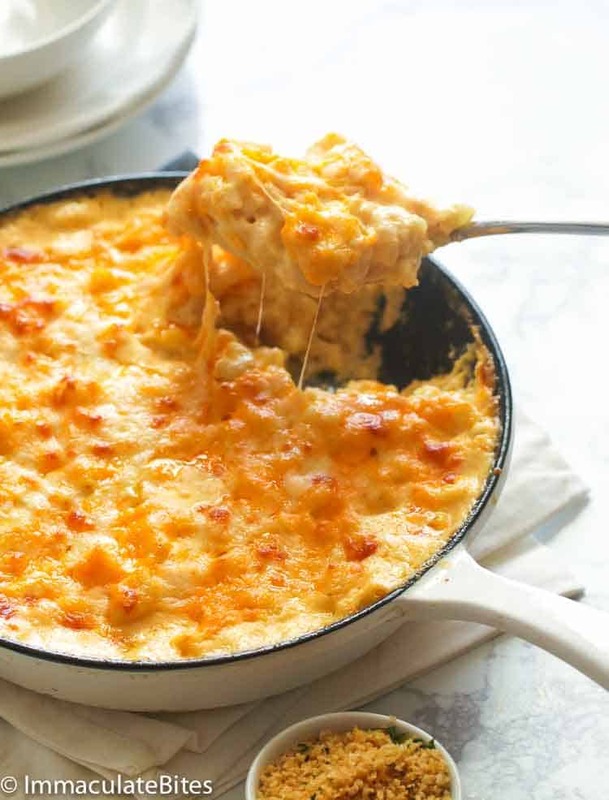 There is only one rule that you need to remember when baking mac and cheese: don’t bake it too long otherwise you’ll bake away the sauce leaving you with dry mixture. 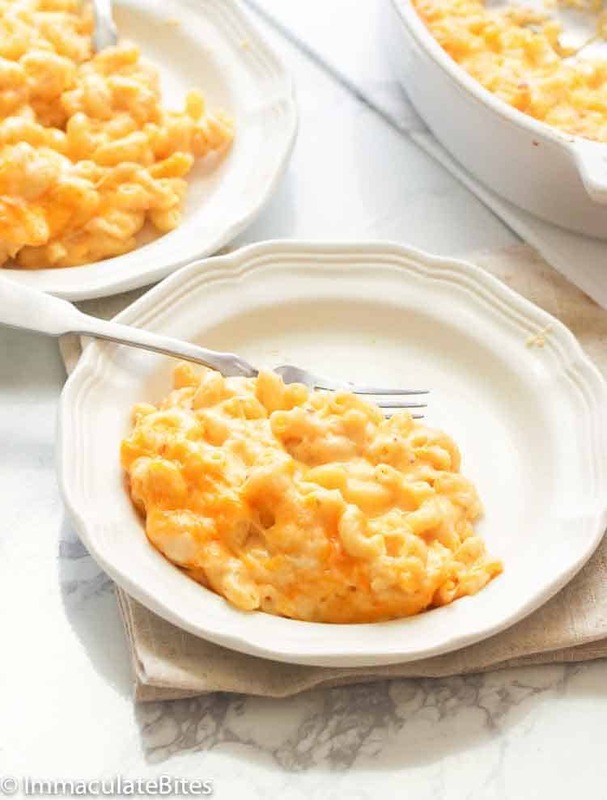 Although we’ve tried a couple of Mac and Cheese recipes, nothing compares to this one which has smooth silky sauce that permeates every inches of elbow macaroni there is. 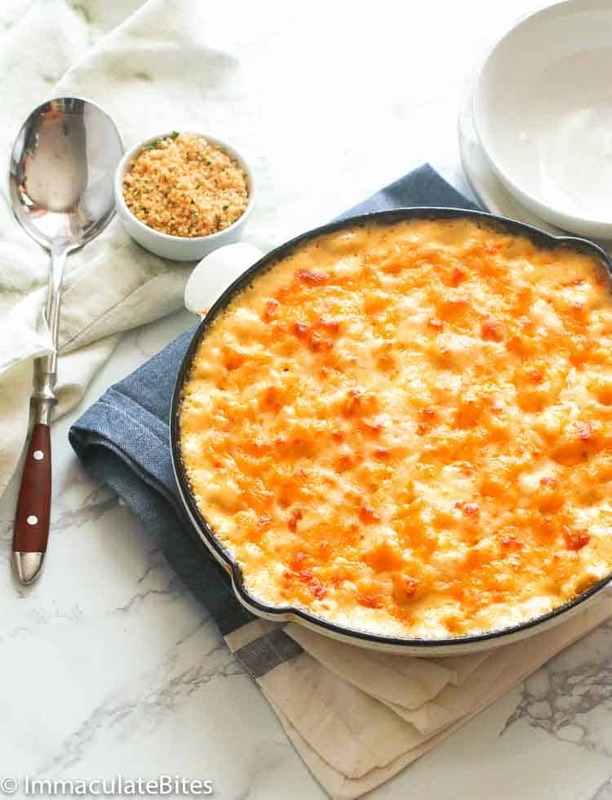 You’d fall head over heels with the brimming Southern flavors of what this baked mac and cheese has to offer. It’s got a note of heat and smokiness. You’d need a bigger a spoon, for sure! This would be delightful at any time. Oh, especially during these cold winter months . So don’t wait for special occasions to whip up a pan of this. Heck, you could even make this on a daily routine. Want more recipes like this? Try my Ground Beef Casserole here and and my mac and cheese the Caribbean way – Trinidad Macaroni Pie. Bread crumbs topping(optional) Place small skillet on medium heat with 2 tablespoons butter ,then toss in 1 teaspoon, minced garlic, stir for about 30 seconds throw in bread crumbs, saute for about 3-4 minutes or until fragrant . Lightly salt and pepper if desired . Then Top the Mac and cheese with the bread crumbs and bake. Don’t use pre-shredded bagged cheese as it is drier. You have to get blocks of it and shred it yourself. Reheat in the microwave if there are any leftover then spray top with oil of butter for moisture. You don’t cover backed mac and cheese with foil as it would steam the inside and preventing to achieve that slightly crusty golden bubbly top. Place small skillet on medium heat with 2 tablespoons butter ,then toss in 1 teaspoon, minced garlic, stir for about 30 seconds throw in bread crumbs, saute for about 3-4 minutes or until fragrant and slightly brown. Lightly salt and pepper if desired . 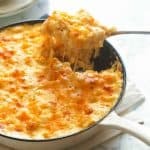 Southern Baked Mac and Cheese – super creamy, cheesy, soulful baked mac and cheese filled with great Southern flavors topped with crispy bread crumb. You will never break open a box again! Add butter to skillet, as soon as butter melts whisk in flour. Continue whisking until flour is fully mixed with butter. Then cook for about a minute to get rid of the flour taste. Slowly add evaporated milk a little at the time, followed by the half and half ; you do not want the mixture to form any lumps. Simmer for about 3-5 minutes until mixture thickens slightly. Add seasonings, onion and garlic powder, creole seasoning and cayenne pepper. Bring to a simmer and let it simmer gently for about 2 minutes. Stir in the cheeses (reserve some as toppings later), and continue stirring until everything’s melted and evenly combined and, smooth. Salt & pepper, to taste. Then add the cooked pasta to the pot, stir to evenly incorporate. Transfer the pasta mixture into a the pan or into a lightly greased 2-qt. baking dish; top with remaining cheese. Bake at 375 Degrees F° for 20 minutes or until golden and bubbly. Add seasonings, onion and garlic powder, creole seasoning and cayenne pepper. Bring to a simmer and let it simmer gently for about 2 minutes. Stir in the cheeses (reserve some as toppings later), and continue stirring until everything’s melted and evenly combined and, smooth. Salt & pepper, to taste. Then add the pasta to the pot, stir to evenly incorporate. I’ve made this recipe now three times and my family loves it I put my own spin on it by adding Chicken Breast pieces,Spinach,Red Bell peppers and Penne Pasta,my daughter took some to work for lunch and now she has co workers asking for the recipe.I sent them to ur site. Thank you for the “FoodLove”(recipe) my family wants me to make it all the time now it’s so delicious!!! I have just taken this out of the oven! Wonderful! I would like to know if you used Monterey Jack or Pepper jack. I used Monterey and it is good. Next time I will put more cheese on too! Yum!! Thanks for this great recipe! Loveeee this recipe! The only problem I encounter is when adding the evaporated milk it always lumps! I have tried adjusting the heat from medium low to the lowest but that doesn’t help . I always end up draining the liquid so get the lumps out but I’m sure that’s defeating the purpose of adding the flour… any advice? Try adding the milk about 2-3 Tbsp at a time. Whisk until it’s incorporated before adding more. Once the can of evaporated milk is all mixed in, add in all the half and half at once. I tried this recipe 3 times. The first time my bechamel was still floury, but the kids ate the mac ‘n cheese anyway. 2nd time was better, but this time it was perfect.I got the bechamel right and the rest fell into place. I used gouda, colby jack and jack as that is what I had in the fridge. I know it will be gone fast! Thanks for a great recipe. If i use 1 cup of each cheese how much half and half and evapprated milk should I use? Why dont you use heavy cream ? Instead of half and half? You can use any of the above!I used mil whole and half n half come out great! Do you have a recipe for Lobster Mac ‘n’ Cheese ? Hi Barbara. It’s already on my calendar. Will be posting it soon. LOVE IT!! That creole seasoning really adds a nice twist. I actually made mine in a muffin pan aince its just me and it helps with portion. Im definitely keeping this recipe around. THANKS FOR SHARING! Indeed, the Creole seasoning is a great addition to this recipe. Glad you like it, Jamiyla. Thanks for dropping by. Can you make ahead of time and refrigerate the.bake when guests arrive? Yes, but the sauce has to be kept separate from the pasta . The day of the event mix together the sauce and pasta , then bake. Thank you, Suzanne, for asking the question that has weighed on my mind! Its on the menu for New Year’s Eve!! This dish was wonderful. My dinner guests on Boxing Day enjoyed every bite and asked for more. In the hustle and bustle I forgot it in the oven and it dried out a bit but it was good. Even the children were asking for more. I used the Cajun seasoning and some Mrs. Dash herbs because I couldn’t find the creole seasoning and noticed that the Cajun seasoning had most of the ingredients if I was to make creole seasoning as per your recipe. Thank you for sharing. Glad it turned out well for you, Racquel. Happy holidays! Thank you for sharing this recipe! My family loved it and my Southern husband said to “only make Mac and Cheese this way from now on.” Lol I used sharp cheddar, pepper jack and munster cheeses! I look forward to more recipes ! Thank you for taking the time to let me know, Shaun! Happy holidays! I made this today for Christmas dinner. 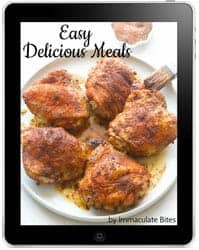 I doubled the recipe and it cane out great and was a huge hit with my family. I am a gluten free vegan so I can’t eat this but I will certainly make it again. Thank you for this recipe. 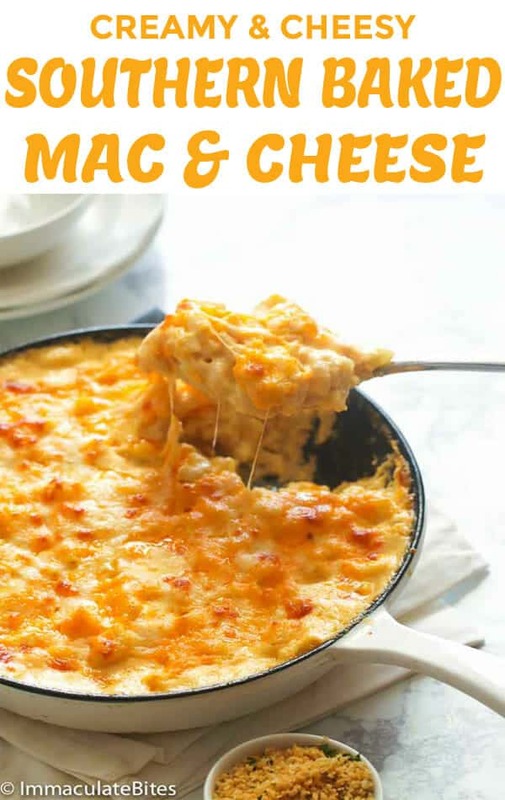 It definitely has more flavor than the Mac and cheese recipes I have tried in the past. Thank you for the flavor you bring to cooking. Can you use already shredded bag cheese? Hi. I’ve only got white cheddar can I use just that? I made this recipe (times 4, I was so nervous the larger quantity was going to alter the taste but it didn’t but) for Thanksgiving and everyone loved it. Buying whole cheese and grating it definitely made a difference. I am making it again for Christmas and will hopefully try different cheeses. I just wanted to thank you so much for sharing this recipe!! I’ve made this 3 times since Thanksgiving 🙂 I’m the aunt that people always ask ‘can you just bring drinks?’ But when I made this everyone LOVED IT -even my picky eater sister- and so many said I should bring it to Christmas Dinner, which is a 1st for me!! Thanks for helping me finally have a GREAT dish people want ME to make and not BUY!! I’m so happy for you, Geni! Wohooo! That’s a major win for me. 😉 And thank you for taking the time to let me know. Made this twice thanksgiving week. SO GOOD. Second time I used less garlic and onion and more creole seasoning. Perfect blend. Am so thrilled it worked out well for you. Thanks for the feedback. I really don’t cook and was just going to buy some prepared mac and cheese. I wasn’t able to purchase any so I hit the internet for a recipe. Found your recipe and decided to try it. It was a total success! My boyfriend cleaned his plate and declared it delicious! Thank you so much! I just have one question. Is there anyway to substitute some of the ingredients to make it lower in calories? Otherwise, I won’t be able to eat it as often as I like! A great way to reduce the calories is to use low fat milk instead of evaporated milk and cut back on half of the cheese.